Here are a few guidelines that may help to give you and others in the community a better understanding of the process we go through when weather is severe enough to possibly call off/dismiss school… just in time for the cooler weather! Q: How is the decision made to cancel school due to inclement weather such as snow or ice? Before making the decision to delay or cancel school due to weather, we rely on critical input from a variety of sources from both district and outside agencies. Throughout the day and night we consult with the Transportation Department about road conditions throughout Christian County. Q: When is the decision made to cancel school? In the event that we cancel or delay school (this can include early dismissal) the CCPS Communications Department is contacted immediately and information is disseminated to the public. Q: How will the public be informed of the decision? · Infinite Campus Message calls are sent to parents/guardians and staff members. · Stay updated through the district’s Facebook & Twitter pages: Christian County Public Schools. CCPS Childcare services are closed when the district makes the decision to cancel school due to inclement weather. This includes morning and afternoon childcare services housed in CCPS facilities. If we are on a 1-hour opening delay, childcare services in our 8 elementary school will open an hour later- same applies for a 2-hour opening delay. Both AM and PM preschool sessions are cancelled for any delay. On a one-hour delay, breakfast will be served to students. On a two- hour delay, breakfast will not be served. Lunch will be served on a one-hour and two-hour delay. When are snowSMART Learning Days used? 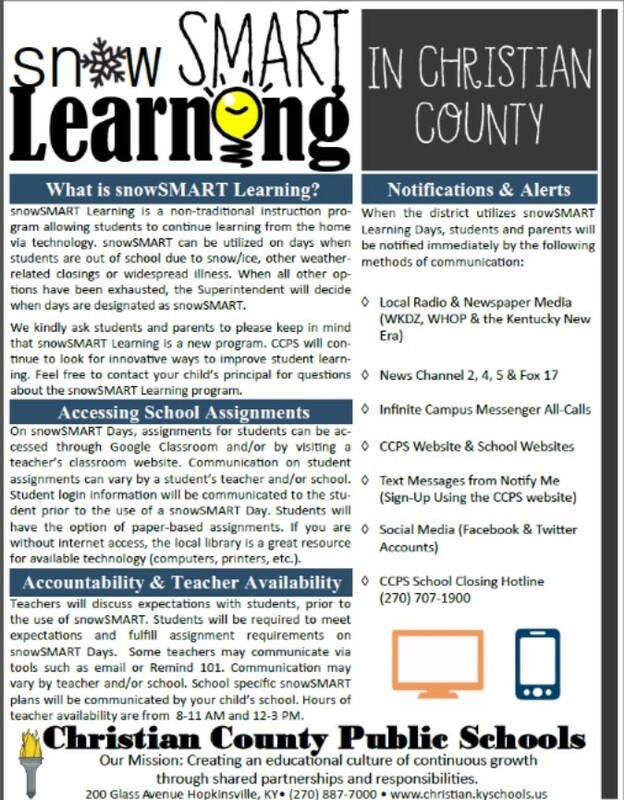 The flyer below shares information regarding snowSMART Learning. To learn more about the snowSMART program specific to your school, please contact your school principal or visit your school's website.